Whether you want shinier hair, younger skin, a healthier body or all three, pure, clear water is the world's best beauty elixir. For years, hairdressers have been saying a cool-water rinse leaves hair glossier. Is it true? Yes! The chilly temp constricts the cuticle layer of your hair so it lies flatter; making strands smoother and more reflective. Depth Refresh Daily Shampoo ($10; Drugstore.com) cleanses without drying, thanks to hydrating sea lettuce and red algae extract in a purified-water base. Rusk Deepshine Sea Kelp Conditioner ($14; Ulta stores) is packed with marine extracts, such as sea kelp, that strengthen and add shine. Plus, UVB absorbers help shield your hair from the sun's damaging rays. Soft shower water leaves hair more manageable because there are few mineral salts (pesky molecules that can make strands rough and prone to tangles). If you have hard water (find out here), install a water-softening shower filter. It can stop your color from fading, too. You probably know from firsthand experience that chlorinated or salty water can turn healthy hair into a frizzy mess. But the fix is easier than you think. "Just rinse your hair in the shower or under a hose before swimming," says Laini Reeves, owner and creative director of Essensuals London, a salon in Los Angeles. "The strands will absorb their fill of clean water, so they won't be able to soak up as much of the damaging water." After your dip, coat hair with conditioner for extra protection from the sun. Ever heard of setting lotions, those old-fashioned solutions that help hair hold a curl? Well, water is truly the most natural setting lotion available. Each of your strands is made up of hydrogen bonds that separate when hair is wet, according to Jeni Thomas, a Pantene senior scientist. If you manipulate hair's texture while wet, "the hydrogen bonds reform as it dries, holding the new shape." Here's how to use that little bit of chemistry to your advantage: Mist hair with water, separate it into four sections, twist each into a small bun and secure with a pin. Blow-dry (or air-dry), then unravel for soft waves. Conditioners contain ingredients like dimethicone and plant oils that smooth and detangle your strands. But that nice slippery feeling they leave behind can actually make your hair harder to style. Reeves says you can fix this problem by misting on a water-based primer, like Shu Uemura Art of Hair Depsea Moisture Foundation ($33; Shu Uemura Art of Hair), after detangling but before applying styling products. "It absorbs some of the oil and rebalances the moisture level of your hair so the style you create will hold longer," she explains. A cold compress helps reduce under-eye inflammation, but you can get a similar effect with H2O. "As water evaporates from skin, the surface becomes cooler," cosmetic chemist Ni'Kita Wilson explains, so a splash of water can depuff temporarily. For a long-term solution, try a cooling, water-rich eye gel like Vichy Aqualia Antiox Anti-Fatigue Eye Stick ($28; drugstores) with brightening citrus polyphenol. For centuries, people in Eastern Europe have gone to bathhouses for water therapy to detoxify and tighten their skin. The process, which involves a steam-room session to open pores, followed by a cold-pool plunge to shock skin, is easy to replicate at home, according to Eva Scrivo, a New York City-based beauty expert and host of Beauty Talk on Sirius Satellite Radio. Just soak a washcloth in steaming hot (but bearable) water, then lay it over your face for a minute. Next, wash with your favorite cleanser and rinse with warm water. For your "plunge," splash with cold water about 15 times. "It may sound old-fashioned, but it really works to invigorate and tighten your skin," Scrivo says. Wrinkles are less noticeable when skin cells are well hydrated, according to Dr. Howard Murad, author of "The Water Secret: the Cellular Breakthrough to Look and Feel 10 Years Younger." He suggests using a moisturizer with humectants, which help attract water to skin cells. Try Olay Total Effects Plus Cooling Hydration ($19; drugstores). Hydrating from the inside makes skin more luminous, nutritionist and author of "The O2 Diet" Keri Glassman says. To see results, drink eight glasses a day. It sounds like a lot, but many women need that much to see a difference in their skin, she notes. No matter what your skin woe, there's a natural water source from around the world that can help -- and a closer-to-home product with the same effect! Find out which products use mineral-rich H2O from around the globe here. Water is about 12 times more resistant than air, so it takes more effort to move while submerged, according to Terry-Ann Gibson, associate professor of kinesiology at Boise State University. That means exercises you do in a pool are extra-effective muscle sculptors. An easy one to try: Stand in water up to your neck, then move your arms and legs as if you're cross-country skiing for one minute. Losing weight improves the look of cellulite, but hydrating from the inside out is the No. 1 natural way to plump skin so underlying fat cells are less noticeable. You can hydrate and slim down by eating water-rich fruits and veggies. One study in Japan showed women who got their H20 this way had smaller waists and lower BMls than those who sipped their fluids. Some of the most water-rich foods are now in season! Here are a few ways to "eat" your water. Zen Buddhist monks have incorporated water features in their meditative gardens for hundreds of years because of their soothing sounds. And studies show listening to nature -- particularly running water and waves -- helps reduce anxiety. Feeling stressed? Place a tabletop fountain at your desk or download the sounds of the surf at Nature Music Download. Soaking in a hot bath before bed can help you transition into a deeper, more restful sleep, a study at Loughborough University found. This bedtime ritual, inspired by the super-luxe Indochine Indulgence treatment from La Costa Resort and Spa in California, will help you get your z's. 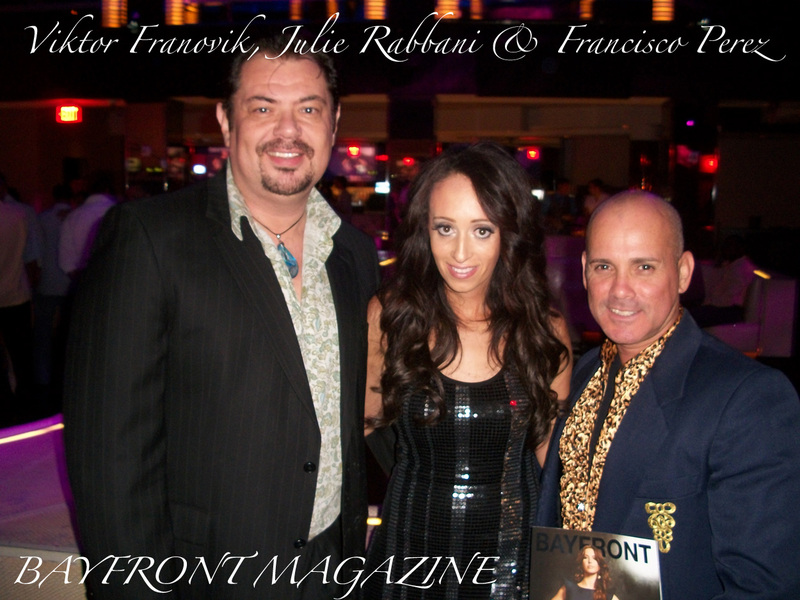 Julie Rabbani, Editor in Chief of Bayfront Magazine hosted a lavish launch at LIV last night. Julie was surrounded by friends, family, photographers, associates, colleagues, local celebrities and featured designers Viktor and Francisco of Franovik Designs. The evening was hot, as most Miami Beach nights are, the music was kicking, drinks flowing and the most beautiful people came out on a Wednesday night to celebrate. Julie looked dashing last night, and the magazine…..the STAR of the evening was sensational. I saw people flipping through the pages, some folks spotted us and came over to congratulate us and ask us why ECO COUTURE; as we explained the why, what, and how most got the picture of what we were all about. It’s about helping the environment and making use of what we have and recreating instead of tossing or putting it away in storage. Recycling is what we do, it’s more than just ECO, it’s creating “Wearable Pieces of Art” and giving back to the community; another part of Franovik, which is fundraising for needy causes. As we waited for LIV to open its’ doors, we took a tour with a bottle of bubbly as we walked all over. It’s been a while since I last visited the Fontainebleau; the renovations are really good. The HUGE bar as you walk in was packed, as I walked out to the pool the breeze was inviting, it said “just lay by the pool and enjoy” not in a suit unfortunately….Maybe next time we will make it a day. All and all it was a great evening full of energy, Miami is such a party town. We met new people and made new friends locally and from the West Coast of Florida, SUP NAPLES!!!!! Thank you Julie, and your staff. You really made us feel special! We are so looking to the future and building on our relationship. Who knows, we could do a launching of Models & Designers, our magazine in Naples too…..